I never thought I would see the day when Miss J begged to do multiple phonics and grammar lessons. This is the case every almost every school day since we began using Jolly Phonics and Jolly Grammar, which are both by jollyliteracy.com. Jollyliteracy.com, also known by the official company name just2ducks LLC, is quite a different program than any I have seen. I’ll be honest and tell you I really don’t like teaching phonics. It seems almost a waste time to me but that is because reading has come very easily for everyone in our family. Even so, jollyliteracy.com has helped me to see the value in teaching phonics, even after a student can read. Miss J is beginning 2nd grade, reading very well, and knows quite a bit about phonics through general day-to-day reading and discussion, plus a previous phonics program. She has not, however, done any specific grammar programs. I give you that just to kind of help you understand why we are using jollyliteracy.com as we are. 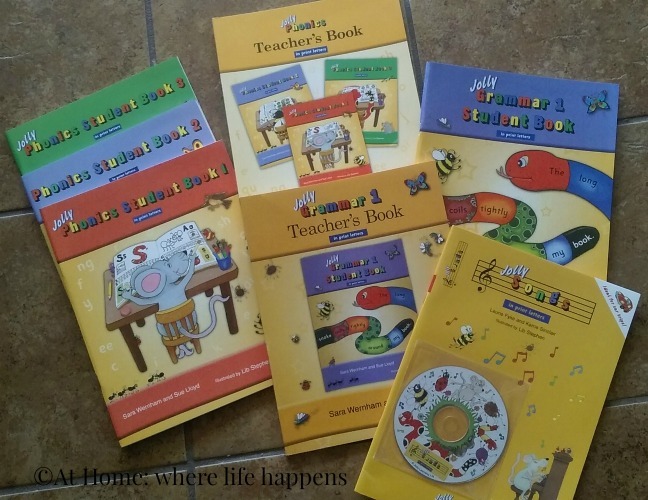 Jolly Phonics came with three Student Books (Student Books 1, 2, and 3 in print letters) and a Teacher’s Book in print letters which includes the lessons for all three Student Books. These three books are progressive in the knowledge, with each one building on the one before. Once we received these books, I looked through them to try to gauge where Miss J would place. Student Book 1 is dedicated to introducing the student to the letter sounds. There is a page for each of the 42 main sounds of the English language. 12 tricky words are covered. Student Book 2 begins providing the student opportunities to practice reading and writing the letter sounds and introduces capital letters. There are alternative spellings discussed for some of the sounds and more tricky words are introduced. Student Book 3 works on better understanding of alternative letter-sound spellings and introduces the remainder of the tricky words. Improvement of comprehension, reading and writing skills are also goals of Student Book 3. All three levels are designed for one page to be completed per lesson. All together, these three books give a complete year of instruction. Jolly Songs book and CD, which we also received, go right alongside Student Book 1, presenting a letter sound in song format with a familiar tune. These tunes repeat and the CD is right there to help you out if you need it. I could easily have chosen to not have her do any of the phonics Student Books as there is quite a bit in Book 3 that she already knew. However, there was enough in there that we hadn’t really covered that I felt it would be a good review and teaching combination for her. 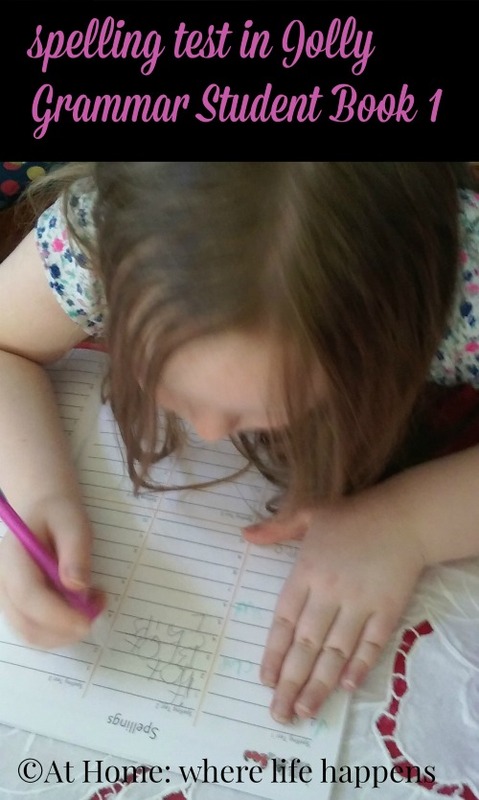 Some of what she knew: the ph sound combination, most of the “tricky words” she could read without any problem, blending sounds, comprehension of simple to mildly complex sentences. Some of what I knew she needed: finding alternatives that make the same sound (i.e. 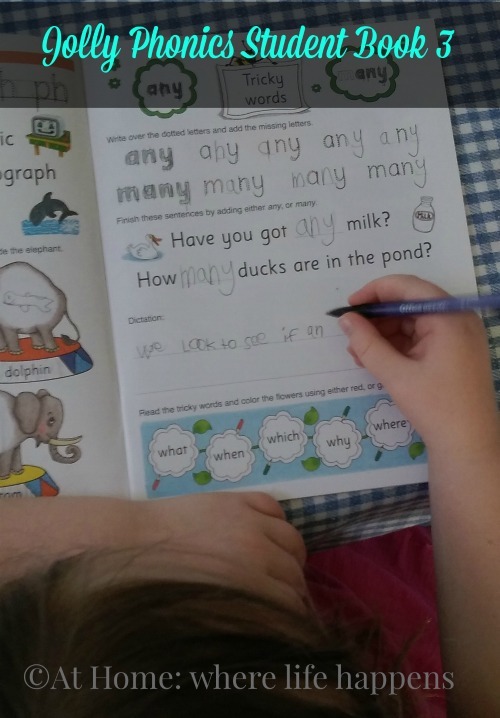 – ou and ow), spelling, dictation practice. We absolutely enjoy using Jolly Phonics. We complete a lesson on Monday and Thursday with Jolly Grammar on Wednesday and Friday. And most days, she wants to do more than one lesson. Alright by me, as it doesn’t seem to affect the phonics program. Each lesson follows a fairly consistent plan. Begin with some review of sounds or tricky words. Give instruction for the lesson, using the page in the student book for some parts. These might include reading, writing, or drawing. There will either be some dictation of simple sentences, blending practice with some more difficult words, or reading some sentences. The Teacher’s Book is essential for this program as it contains many things that are not in the student book for each lesson. Each page is colorful, simple and draws Miss J right in. As I said, she really likes this program and asks to do more than one lesson a day. Sometimes, she asks to do both phonics and grammar on the same day. Which brings us to the grammar program. Jolly Grammar 1 is what we have been using. We received Jolly Grammar 1 Student Book in print letters and Jolly Grammar 1 Teacher’s Book in print letters. Jolly Grammar is just as simple to implement as Jolly Phonics. It’s bright, colorful, and uncluttered pages make it a joy and it draws the student right to the page without being a distraction. This program follows the Jolly Phonics program with the goal of teaching basic grammar, spelling, reinforcing the phonics program, and improving comprehension and vocabulary. 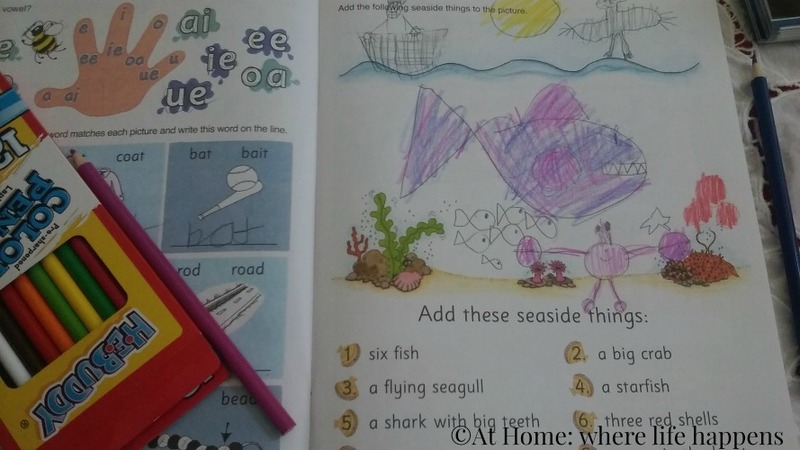 The Teacher’s Book is required for this program, as with the phonics, because it contains a number of pieces for each lesson that are not printed in the Student Book. Jolly Grammar is intended to be taught with two lessons a week. This gives you approximately 36 weeks’ worth of lessons in this program. This equates to a single page per lesson. One lesson is designed to be mostly spelling and the other mostly grammar. Again, we are using this in combination with the Jolly Phonics, so we are alternating days and seeing a lot of overlap, which is quite good. I contacted jollyliteracy.com to ask about the combination of the two programs and she felt like, based on what I told her about Miss J’s abilities, that this combination would work fine and I have been very pleased. Examples of activities from the grammar book include: finding words that have a particular sound in them, listing the words, and illustrating them; finding mistakes in sentences such as missing capitals and periods in the wrong place; and, dictation of words and sentences. Spelling tests include 10 words and have a special place at the back of the student book for writing the test. The biggest issue we are having is that Miss J is enjoying these two programs so much that she really wants to fly through them. Which is hard when every other lesson in Jolly Grammar includes a spelling test! But, Miss J is a very good speller so these are pretty much reviews for her. Except for the long word included in each list. Those are giving her problems but she is still loving it and the challenges the program presents. And I am enjoying using this program to teach. 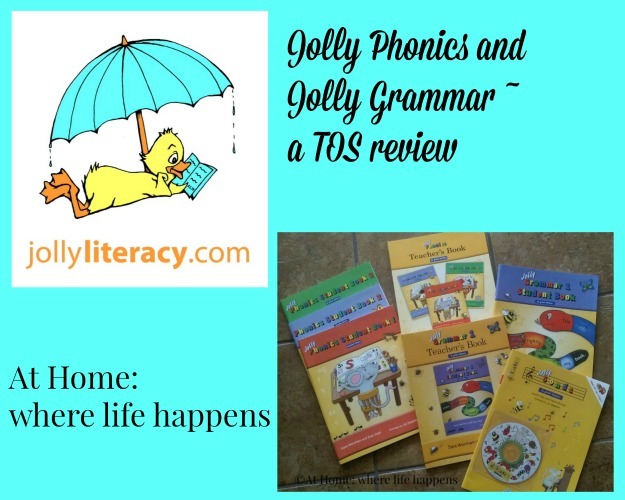 Published by just2ducks LLC, Jolly Phonics and Jolly Grammar get my vote. Please visit the Review Crew to find other families who have been using jollyliteracy.com and to read about their experiences.